It’s been some time since I made this felt embroidery. I’ve made several other projects since and thought I would share one of the lessons I’ve learned to make things easier. 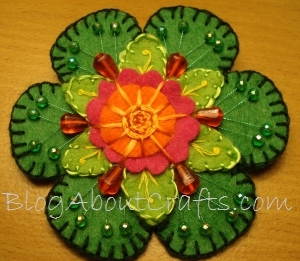 When I made this felt flower, I started by cutting out a matched pair of the green background pieces. I set the back off to the side while I embroidered and adorned the front. Problem was, when I went to put the two pieces back together, they were no longer the same shape and size. The one I have been working with had mysteriously gotten bigger and out of shape. Of course, it wasn’t much of a mystery as to what had happened. Part of the reason felt is so much fun to work with is the way it doesn’t fray. But, in exchange for not fraying, felt is easily stretched and can almost disintegrate when the pieces are cut too small. An embroidery hoop will keep your felt embroidery from stretching out of shape. No, I’m not saying to put the felt in the hoop – one it’s too thick and two it will simply stretch out of shape in new and interesting ways. Once the fabric is as tight as it can be in the hoop, I simply laid my felt piece on the fabric and stitched through both the felt and the fabric in the hoop. The trick to making this work is to not stitch any closer to the edge of the felt than about 1/4 of an inch. That way you can trim the fabric to a size smaller than the felt so that when you sandwich the embroidered piece of felt to the back piece of felt, the fabric won’t show. Obviously, you would want to use a much smaller hoop than I am showing here if you were going to work with the pink heart I used. In addition to keeping your felt embroidery from stretching, the second layer of fabric will help prevent your stitches from working through the less densely woven felt. I’ve had several knots work their way through the felt if I’ve tugged too hard when placing a bead. It also makes it easier to run the thread from one side of the felt to the other without the felt puckering. No more knotting and restarting on the other side of a small piece simply because the felt would collapse when the stitch is pulled taught. I also found it added a bit of strength and heft to the pieces which would hopefully make them more able to stand up to long-term wear and tear or naughty kitties who think your felt pins were made for them to play with. An added benefit of the extra layers is it helps to get bulky items to lay more flatly on the surface of the felt. 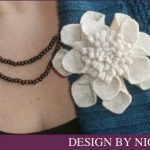 In the case of my button project, I was able to get a button with a wired flower to lay flat on my piece simply by removing a bit of the felt and stitching the button directly onto the fabric base. The pitfall to this method is that if you are making pins or other items for sale, it will add a bit of cost to your project. On the other hand, I have found it tremendously cut the amount of time I spent on the piece and significantly decreased the frustration factor. Besides, you can pick up old sheets and fabrics at thrift stores for super cheap. Just make sure the pattern isn’t so dark that it might show through your felt. Thank you very much for detailed instructions, I would never have thought to do embroidery that way, I will try it next time. Meanwhile I still have to do the one I have already cut out. It is a felt bird on a twig with 2 leaves. The twig is embroidered, but the leaves are felt, no problem with the felt, but keeping the wax paper in place as I embroider the twig is a bit of a problem. Others say to pin it, but I didn’t leave enough paper to pin, I can’t glue it and I have no spray glue which they say is OK to use. It is only a very tiny bird a bit under an inch long, and it is sitting on the twig. Anyway, will try your method next time, have only just started doing this kind of thing, before I decorated with sequins and beads. Lately I have started to add embroidery but freestyle, with no lines or anything, and it turns out not too badly. More practice will help I am sure. Thank you for stopping by and letting me know you found my little embroidery tutorial useful. What I do with stubborn pattern pieces or pieces I need to place precisely is find some high contrast thread (a color that looks hideous with the piece and is easily differentiated from the threads you want to keep) and baste the pieces together. Just enough stitches to keep things from moving around and when possible away from any final stitching I will be doing. Once I finish the “real” stitches, I carefully remove the basting stitches. If you have to, snip some of the stitches rather than sew over them. As you do the “real” stitches, they should start holding everything together for you anyway. When I’m done, I usually have very little of the basting thread left since I generally pull it out as I go. 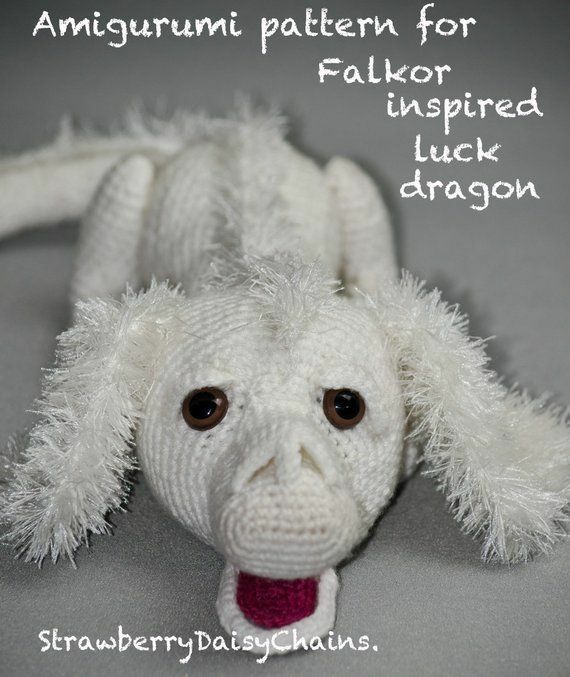 Good luck and thank you for visiting The Crafty Tipster and leaving such a great comment. Sew it in and embroidery hoop. Duh. Brilliant. Now why didn’t I think of that? Like the pin too. So pretty. Terrific work! This is the type of info that should be shared around the internet. Shame on Google for not positioning this post higher! Thank you for the compliment; my sentiments exactly. Though, I’m not really inclined to accept spam on my site, I thought this way I could beat you at your own game. 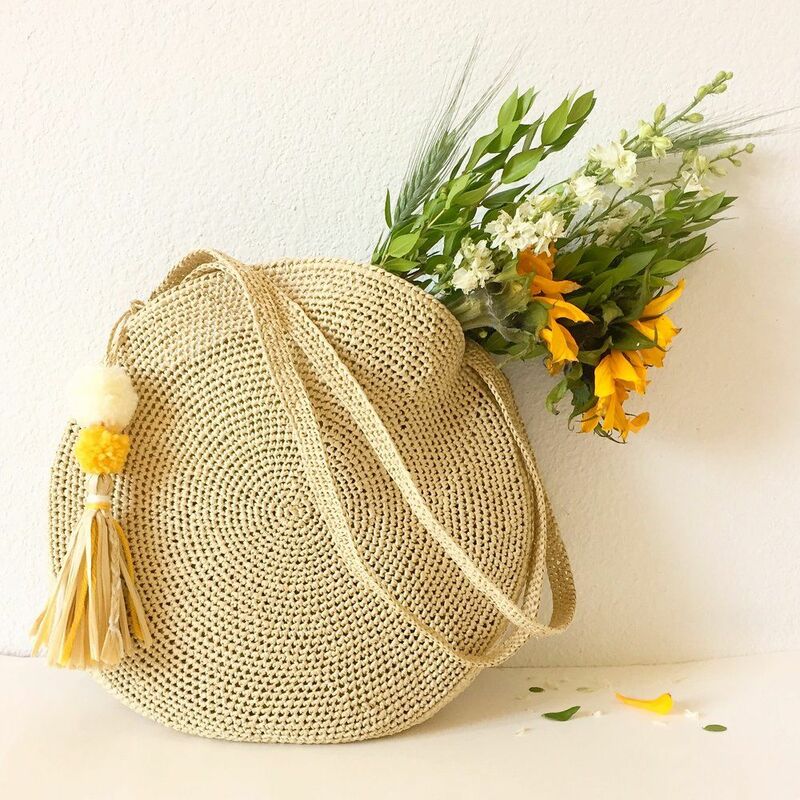 What is the pretty stitch you used to piece the back and front together? 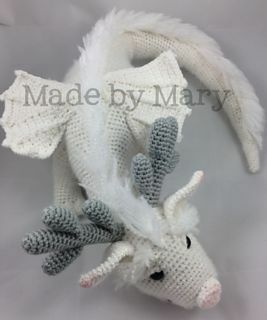 I want to learn how to make it. Thank you. And that you for the embroidery hoop idea! You are most welcome to the embroidery hoop tip. The stitch is super easy; it’s called the blanket stitch. 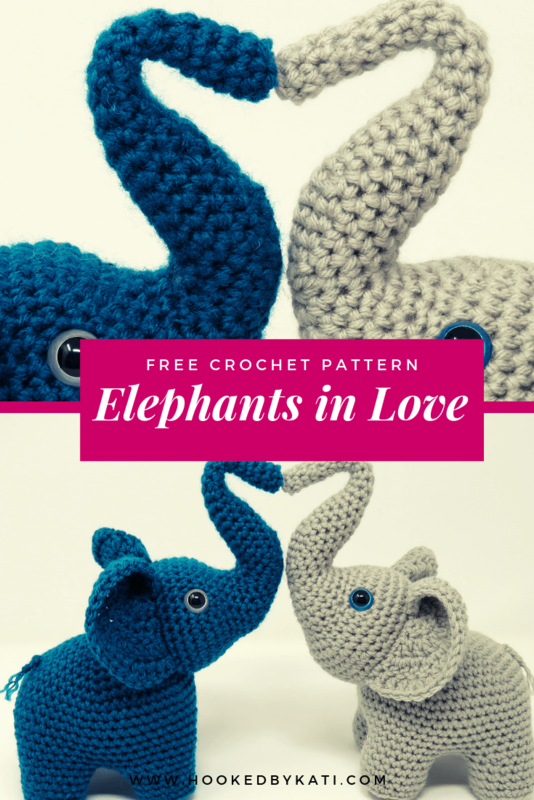 And, I have a tutorial for it too! Just check out my blanket stitch tutorial; it’s a great way to join pieces of felt of other fabrics that don’t fray too much. 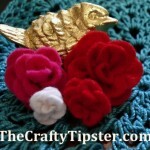 Thanks for visiting The Crafty Tipster and it’s always nice to hear someone enjoyed my posts.